Our professional cleaning company cares about providing the most enjoyable cleaning experience. This is possible with our customized domestic cleaning programs, including regular services and also one-off cleaning in Thurrock RM17. 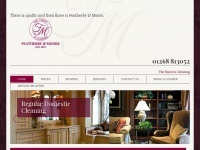 We're happy when you are satisfied – with Featherby & Moore quality results are always guaranteed! The web server with the IP-address 80.84.60.181 used by Cleanersthurrock.co.uk is run by Dedicated Server Hosting and is located in Great Britain. This web server runs 1 other websites, their language is mostly english. A Nginx server hosts the websites of Cleanersthurrock.co.uk. For managing the data of the webpages the CMS WordPress is used. The website uses the latest markup standard HTML 5. The website does not specify details about the inclusion of its content in search engines. For this reason the content will be included by search engines.